Pets are most beautiful part of our lives. From giving us companionship to be present in our most stressful conditions, they are always there to keep us healthy and happy. Not going for a walk daily, feeling depressed, can’t handle stressful conditions, being lonely with nobody to share and withdrawn from social networks, then you need to own a pet. A furry pal is of more use than any other thing in your life that helps you enjoy every bit of life. Your lovable four-legged companion plays a crucial role in keeping you healthy and making your life more meaningful. With dogs in your house, you will exercise more. Dog owners have to walk the dog and this indirectly pushes them to take those extra steps for healthy body. Dog owners tend to get more physical activity than people who don’t have a pet at home. A study states that dog owners walked to an average of 300 minutes per week, compared with non-dog owners, who walked an average of 168 minutes per week. People who have strong connection with their pets also have excellent social and relationship benefits. Strong attachment to pets reported feeling more connected to their communities and relationships. A recent study at the Cummings School of Veterinary Medicine at Tufts University states that if a person is strongly attached to his/her furry pal as a teenager and young adult, he will grow up as more empathetic and confident person. Thus, you will grow your networks and improve your relations. Pets are those fun-filled companions that make you feel happy always. Just engaging with them or looking at them makes you more fulfilled and happy. A 2009 study by Miho Nagasawa of Azabu University in Japan has stated that one’s level of oxytocin (a chemical element that depicts the feeling of happiness) is raised remarkably after interacting with a dog. Moreover, the only interaction that helps to raise the level of happiness was to stare into their dog’s eyes. Amazing point: a dog’s willingness to look into humans eyes is the crucial factor that separates them from wolves. If you are more into stressful conditions, then having a pooch really helps you out from this situation. Pets have that power to cool you down significantly when you are in high-stress situation. A psychology professor at the University of Buffalo has performed a series of tests that proved to help reduce people’s everyday stress. Through her research, Karen Walker had found that the subject’s stress response was significantly lowered if there was a dog in a room. Researchers have found that dogs have been proven to be helpful in therapy programs. They help in the recovery process of soldiers going through post-traumatic stress disorder. Whether it’s recovery from dreadful trauma or post surgery stress, pooches are at best to dissolve the traumatic stress of any event and help patients to get back to normal life. Most people face problems of loneliness especially exclusively elderly people are more prone to this condition. Having a pet by your side makes you feel complete and his/her presence makes you feel less depressed. A study stated that in people 60 years of age and older, owning a dog or a cat, were four times less likely to be diagnosed as clinically depressed. It has been proved that, compared with non-owners, pet owners made fewer medical visits over the course of the year. So, if you are really having that urge of owing a pet, then make no excuses and add a pooch to your family. Having a dog by your side staring into your eyes, make you feel proud that how your little companion is all set to bring a difference in your life helping you to be healthy. 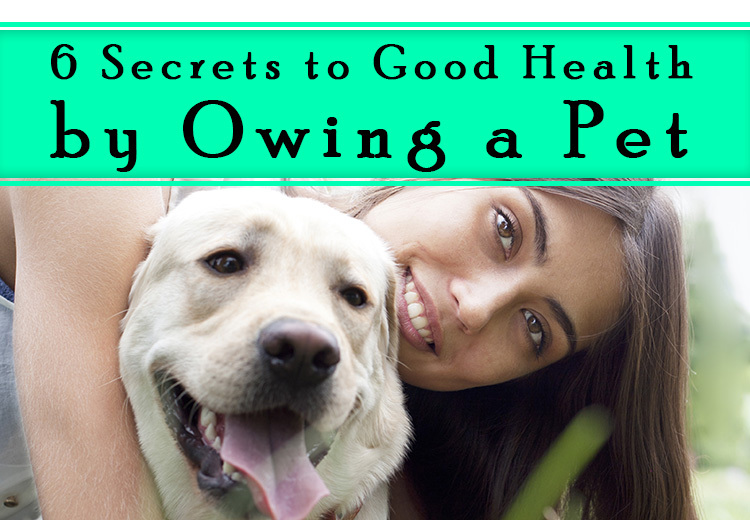 Don’t miss a chance to enjoy a healthy lifestyle by owning a furry pal.